The December, 2012 meeting started off with some announcements. The Board is still seeking a Treasurer and a Recording Secretary. Please contact the Guild if you are interested in either position. Lily Chin provided a brief overview of her upcoming workshops. In the Double-Ended Circular Tunisian Tapestry workshop, you will learn her technique for creating a Fair Isle effect with no floats and no seams. The required hook can be purchased at the Lion Brand Yarn Studio using the 10% discount for Guild members. 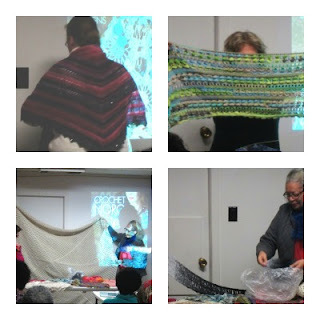 In the Color Composition, Scale, Stitch, and Pattern in a 2 Dimensional Design workshop, Lily will use an afghan as a primer for looking at crochet from an artist's point of view. The workshop location is wheelchair accessible. Members can still sign up at the January meeting. Then there was time for show and tell. 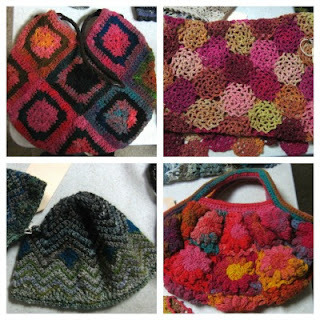 Many members shared designs made with Noro yarns. 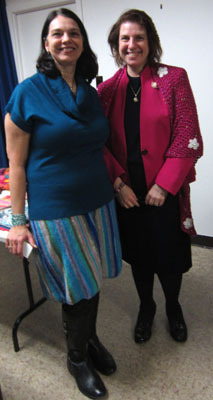 The featured speaker was Carla Scott, the Executive Editor of Vogue Knitting and the Editor-in-Chief of Knit Simple. 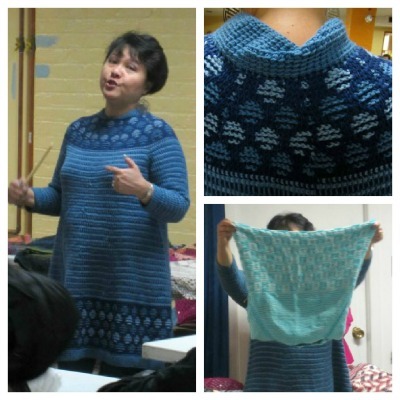 Carla has been with Vogue Knitting since 1982 and has been crocheting and knitting since childhood. Carla Scott with Madame President. Carla shared a slideshow about the new Crochet Noro book, published by Sixth & Spring. She talked about how they tried to include several crochet skill levels and project sizes in the book. 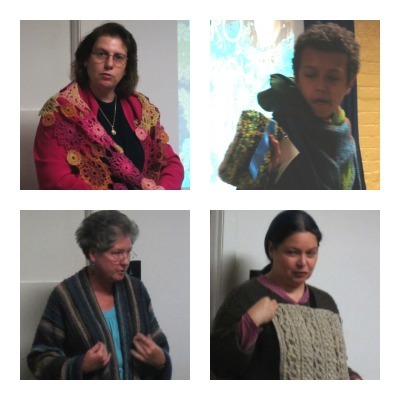 After her talk, members were invited to take a closer look at samples from the book. Members also donated over 100 hats, scarves, and mitts which were delivered to Streetwork in December! 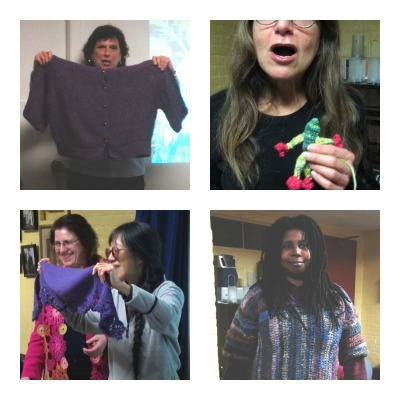 Finally, members were encouraged to check out the crochet classes at Vogue Knitting Live, which will take place at the Marriott Marquis from Friday, January 18 through Sunday, January 20, 2013.